The bak file extension is related to the Visual UML, UML modeling software for Microsoft Windows operating system. The bak file stores backup of document created in the Visual UML. Unified Modeling Language (UML) is a visual language for specifying, constructing, and documenting the artifacts of systems. 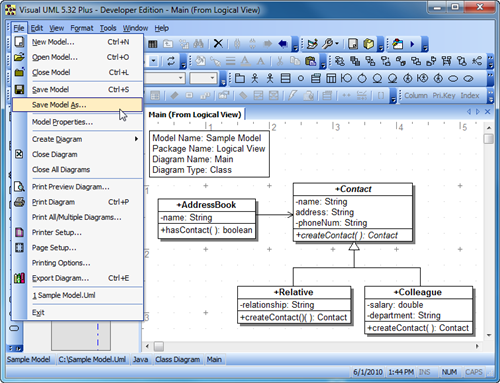 Visual UML (VUML) is utility used to modeling UML (Unified Modeling Language) objects. Use Visual UML to work with *.bak files. Programs supporting the exension bak on the main platforms Windows, Mac, Linux or mobile. Click on the link to get more information about Visual UML for open bak file action. Programs supporting the exension bak on the main platforms Windows, Mac, Linux or mobile. Click on the link to get more information about Visual UML for create bak file action. Programs supporting the exension bak on the main platforms Windows, Mac, Linux or mobile. Click on the link to get more information about Visual UML for backup bak file action.